Fond du Lac County authorities now have a face to work with in their efforts to identify a Jane Doe whose partially decomposed body was found by deer hunters last fall. Experts helped develop the digital facial reconstruction through the National Center for Missing and Exploited Children. Sheriff Mick Fink says they are still looking at the death of the young woman as a homicide. The woman was Caucasian, possibly Hispanic, Asian or Native American. Sheriff&apos;s detective Charlie Sosinski says they are also developing Facebook and MySpace pages hoping potential "friends" can help them learn the woman&apos;s identity. Fink says the reconstruction may help them over a monumental hurdle in their investigation, in that until they learn the woman&apos;s identity they can&apos;t take the next step in their investigation. 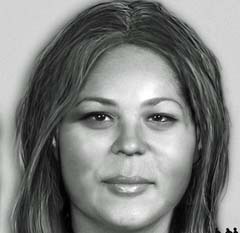 Information about the young woman and her composite photo are available on the Sheriff&apos;s website .